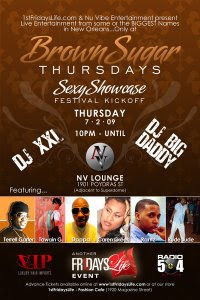 ashlee nicole spills | blog: Brown Sugar Thursdays Showcase @ NV Lounge. Celebrate with the city of NOLA and it's local artists as they showcase their talent @ NV Lounge. Two of the city's BEST DJs will be hosting the event: DJ Big Daddy and DJ XXL. This event is FREE before 12a and will have an exclusive guest list. To get on the list, email your names to nvnuvibe@yahoo.com.